Natural gas is retrieved from underground shale deposits through a process called hydraulic fracturing -- also known as hydrofracking, hydro-fracturing, fracking, or simply fracking. During hydrofracking, millions of gallons of water mixed with industrial chemicals and proppant -- sand or ceramic particles -- are blasted into the well bore to release natural gas. In the Marcellus Shale formation in the Northeastern United States, for example, fracking a single well can require 1 million to 5 million gallons of this water mixture. Waste water from shale gas drilling goes by two names: flowback and produced water. These terms are often used interchangeably, but they have different meanings. The amount of flowback and produced water varies greatly among wells, and not all shale formations produce a lot of water. Two that produce little or no water are the Lewis Shale, located in the San Juan Basin of New Mexico and Colorado, and the Fayetteville Shale in Arkansas. After drilling and fracturing a well, water may come out of it along with the natural gas. Some of the water is returned fracturing fluid and some of it occurs naturally in the geological formation. These produced waters move back through the wellhead with the gas. Flowback and produced water are considered hazardous waste and must be disposed of safely. According to the Environmental Protection Agency (EPA), produced waters are typically disposed of in deep wells or “non-potable coastal waters.” Flowback and produced water contain salt, industrial chemicals, hydrocarbons, and radioactive materials. Salt. Flowback and produced water are highly salty. This is because salts are added to the fracturing fluid and also released from the geologic formation. Produced water is so famous for salinity that the hydrocarbon industry often refers to it simply as “saltwater” or “brine.” In the Marcellus Shale, flowback water has been measured at 32,300 mg per liter of sodium. For comparison, EPA guidelines call for a maximum of 20 mg/L in drinking water. Industrial chemicals. Flowback and produced water contain chemicals that have been injected into the well to facilitate drilling. For example, in the Marcellus Shale, flowback water contains high concentrations of sodium, magnesium, iron, barium, strontium, manganese, methanol, chloride, sulfate and other substances. Hydrocarbons. Produced water can contain hydrocarbons -- including the toxic substances benzene, toluene, ethylbenzene and xylene – which can be freed during the drilling process. Radioactive materials. Water returned to the surface during drilling can carry naturally occurring radioactive materials, referred to by the industry as “NORM.” Flowback and produced water from several large U.S. shale formations have been found to contain the radioactive element radium. When produced water is salty and rich in chlorides, radium tends to be present in higher concentrations. The EPA allows a maximum of 5 picocuries of radium per liter of drinking water. 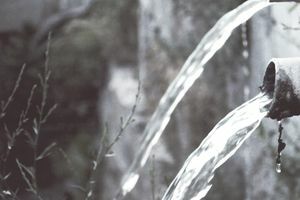 Produced water has been found to contain radium levels as high as 9,000 picocuries per liter (pCi/g).